WiBotic provides the most reliable wireless power and battery intelligence solutions to charge your aerial, mobile and aquatic robot systems.Using WiBotic wireless power and battery intelligence solutions, you can greatly enhance the working efficiency of your robot fleets and save significant money in charging and maintenance costs. Our solutions include wireless power delivery, battery intelligence and fleet-level power management software. So we not only maximize the battery life of each battery we charge, we create an operational plan for the entire collection of batteries in your robot fleet. WiBotic wireless power and battery intelligence solutions are safe, reliable and scalable. And they are easy-to-implement and highly customizable for specific robot deployments. Keeping batteries charged is a major challenge facing all commercial drone applications. WiBotic wireless power and battery intelligence solutions extend battery life and optimize the productivity of drone fleets. Whether your application is operator-driven or fully autonomous, we enable drones to do more! 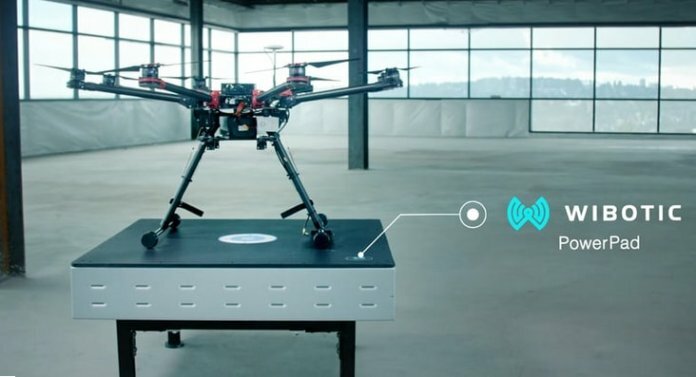 WiBotic is also proud to announce the availability of the WiBotic PowerPad, the first autonomous wireless charging pad for drones. Coupled with the WiBotic Development Kit, the WiBotic PowerPad provides a ready-to-go solution for repetitive drone flights in a wide range of industries. WiBotic is working with drone companies creating solutions for agriculture, security, surveillance, monitoring and delivery applications. We provide an integral component that enables their drones and drone services to become reliably autonomous.